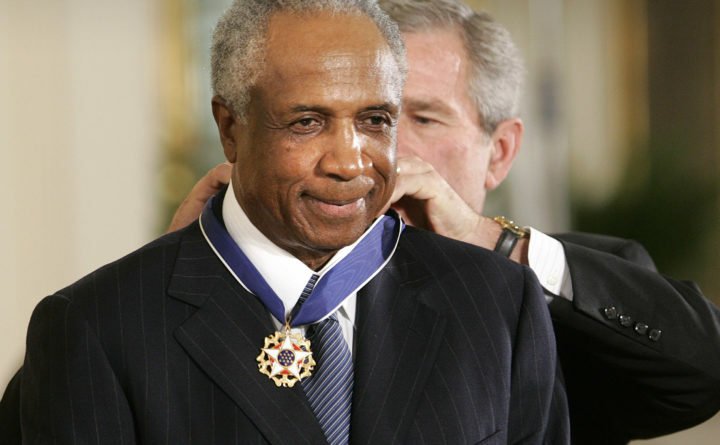 In this Nov. 9, 2005, file photo, President Bush awards baseball legend Frank Robinson the Presidential Medal of Freedom Award in the East Room of the White House in Washington. Hall of Famer Frank Robinson, the first black manager in Major League Baseball and the only player to win the MVP award in both leagues, has died. He was 83. Robinson had been in hospice care at his home in Bel Air. MLB confirmed his death Thursday, Feb. 7, 2019.